Edited by Beth Towe Fifth House publishers 2018/$60.00/312 pp. When well-known early 20th-century Banff photographer Byron Harmon was roving the central Rockies around Banff, capturing his now-iconic black and white images, a lesser-known contemporary was doing the same work farther south in the Waterton Lakes region. His name was Bert Riggall (1884–1959). 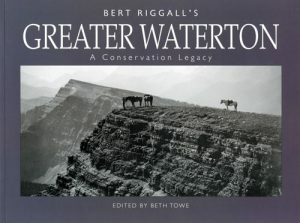 While on a grand tour in 1904, away from his native England, Riggall discovered Waterton and settled permanently in the area, where he built a successful outfitting business, spearheaded conservation efforts and generously shared his knowledge of the region’s natural history. Photography was his passion. He amassed a collection of over 14,000 images, many of them high alpine panoramas. The bulk of those are housed in the archives at the Whyte Museum of the Canadian Rockies. Despite the timely essays, Riggall’s photography remains front and centre. Only a few text-only pages are encountered, and there are 34 two-page spreads of Riggall’s panoramas, taken with a Kodak Panorama No. 1 during the 1910s. Many of these are from alpine perches that few people visit even today. Greater Waterton avoids academic discussions that would problematize Riggall and his work. There is almost no critical discussion here about how the photographer “sees” or on what he chooses to include and exclude from the frame. This is not to say that Riggall and his work could not be subjected to such an analysis, but that would be a different project. Here, editor Beth Towe brings general readers a unique, high-quality collection that instills respect for the land and a stronger sense of place. —Jeffrey Doherty is a writer in Lethbridge.